If you’re looking for the best possible 50 foot-long leash to use while training or playing with your dog, you’ve come to the right place. Your satisfaction is GUARANTEED. As a dog trainer, it’s vitally important to me to have a leash that’s long enough to allow my dogs to run while still giving me total control. When I finally found the best possible leash, I had to have it CUSTOM MADE – because you basically can’t find a leash like this in your local pet shop. Or online, for that matter. If you can even find a leash that’s long enough, it will inevitably be made from inferior material, in the wrong color, and be prohibitively expensive. My goal is to offer these leashes at an affordable price so that you can see for yourself how having the right leash, the BEST leash, actually makes a huge difference when you’re working with your dog. Itʼs 50 feet long. Long enough that your dog can actually run. 1″ nylon. This leash has substance. It lies flat, not prone to tangles, and glides easily through your hands, even when wet. It feels right! Unmistakable bright Hunter Orange color. You cannot miss this leash, as itʼs very visible against the natural landscape. It makes you the envy of all the short-leashed people out there. Great for dog training. You can train your dog as if they were off-leash, while still having the peace of mind that they wonʼt be able to run away. Woven in the USA. Dyed in the USA. Made in the USA (with the exception of the bolt snap, which is imported). 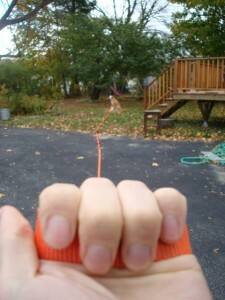 Here’s a view that shows you just how long this leash is. I’m at one end, and my dog, Nola, is at the other end. You can click on the photo for a larger image. My dog: Off in the distance, and totally under control. Ok – you KNOW that you want an extra long leash. Maybe you don’t even need to hear how useful they are – you already understand that! What makes THIS leash so special? We’ll revisit the list above, only this time we’ll offer some comparisons to whatever else you might find out there. 50 feet long. Generally the longest leashes that you can find are a mere 30 feet long. 30 feet might seem long enough, but if your dog is bigger than a yorkie they won’t be able to run without quickly reaching the end of the line – which can actually be dangerous.I’ve found that 50 feet is a great length, allowing most dogs to experience immense freedom of movement while you hold on to one end. Or if you choose to let the leash drag behind your dog, 50 feet gives you PLENTY of reaction time should your dog decide to chase the neighbor’s cat. Nylon. Do retailers ever try to use the leashes that they sell? For one thing, most long leashes that you find will be made with cotton. Now don’t get me wrong, I’m all for renewable resources (it’s just that hemp is so darn expensive!) – but cotton is the WRONG material for a leash.Here’s why: Cotton creates a ton of friction when it slides through your hands, which can create serious burns (trust me, I’ve experienced it). Furthermore, as soon as cotton gets wet, it stiffens up. So after you’ve taken one spin on your early-morning-dew-soaked lawn, forget it! That cotton leash becomes a stiff mess of webbing as it dries, making it very difficult to manage.Most likely, that stiff cotton leash will simply break the next time your dog gives a strong tug on it. The nylon that we use is much smoother and softer (read: less friction as it slides through your hand) and it retains its pliability even after repeated exposure to moisture and the elements. 1 inch wide. Width matters. Those other leashes that you see that are 5/8 inches thick are much more difficult to manage, especially with any exposure to “weather”. They’re more likely to get tangled and knot up, and give you less to hold onto.The 1 inch width of our leashes makes them very easy to grip, much less likely to tangle, and much easier to untie should a knot form in the webbing. Plus it’s STRONGER! Think about it – these leashes are nearly DOUBLE the width of what you’d find elsewhere – an appropriate width that gives you the control you need without becoming unwieldy. Hunter Orange Color. When your dog is running in the opposite direction, do you want to spend that extra second hunting for the nice green or black leash as it whips through the grass? No way!The hunter orange color (I swear it’s the new black) will allow you to respond in a split second to grab the leash if you need to. It has added benefits if you go for walks in the woods during hunting season.It also makes it easy for anyone who comes upon you and your dog (perhaps when you’re playing fetch at the park) to see that your dog is on-leash and under your control even when at a distance. I’ve found that this awareness actually fosters greater responsibility in the OTHER dog owners I encounter as well – in fact, many of them ask me where I got my awesome leash! Made in the USA – and satisfaction guaranteed. This leash is a great product made by great people right here in the States. You KNOW that any other leash you get, pretty much anywhere, is imported. It was important to us, once we figured out exactly what kind of leash we wanted, to ensure that as much of our production took place stateside.As for the guarantee – if the leash doesn’t exceed your expectations of what a long leash should be, just return it within 30 days and I’ll refund your purchase price, no questions asked. It’s all of the qualities mentioned above that make this leash perfect for dog training – and something that will inspire the people you encounter to ask you where you got it (please send them my way!). The best dog training leash is yours for only $33.95 plus Shipping/Handling. All leashes are shipped U.S. Priority mail – and we can also ship to international destinations. Delivery time is 2-3 business days (slightly longer for international deliveries). You can be enjoying the benefits in no time. Yes – we pack and ship the leash as soon as the order drops into our e-mail inbox. Have you ever had your dog get away from you? Do you remember the frustration of the dog running away every time you got within a few feet to try and grab their collar (or the end of a short leash)? Or perhaps you have seen your dog run towards traffic as you are running after it? Using this leash you only have to get within 50 feet of your dog to regain complete control. Have you ever wanted to give your dog a little freedom at the park, but been afraid of violating the local leash law? 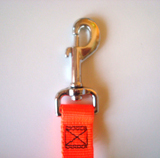 Now you can give your dog that freedom while avoiding costly animal control violations. I can’t guarantee you won’t get a ticket – but I can tell you that the animal control officers appreciate that you’re at least honoring the spirit of the leash law. And this leash is long enough to accommodate a spirited game of fetch. Have you ever tried to train your dog to be off leash only to have your dog take off after a cat or a squirrel because they’re not quite ready? You can let this leash drag behind your dog, freeing you up to focus on your training and giving your dog the feeling of being off-leash – but quickly grab the leash if the need arises. As a dog trainer, I can tell you that most people have the goal of having a dog who’s obedient when they’re off-leash, but since they train their dogs using a tight/short leash the dog learns to depend on the feedback from the leash. This dependence makes a transition to off-leash obedience very difficult. When you use a long lead (that simply drags on the ground behind your dog as a safety mechanism for the moments when your dog decides to take off), your dog learns how to do things such as coming when called and heeling without the restriction of a leash from the get-go. So you’re actually training them to do things “off-leash” from the very beginning! The transition back to “on-lead” (i.e. with you actually holding the leash) is much easier than the other way around. With our 50 foot dog leash, you are buying not only a quality dog-trainer-approved leash that’s made in the U.S.A., you are buying years of enjoyable play time, training time, and walks with your dog. There are a lot of buying decisions to deliberate over, but this surely isnʼt one of them. This leash, the best dog training leash that you’ll find, can be yours for $33.95 plus S&H. Try it out. If it doesnʼt revolutionize your dog playtime and/or dog training experience within 30 days, Iʼll quickly refund your purchase. Click the “Add to Cart” button to purchase the Best Dog Training Leash from our secure store.